Our due date calculator calculates your estimated due date from your last period, conception, or ovulation date. A due date calculator calculates your estimated due date (EDD) which is an ESTIMATE of the day you are likely to go into labor spontaneously (without medical intervention). Only about 4% of babies are born on their estimated due dates but the majority (70%) are born within 10 days either side of their due dates. The Estimated Due Date (EDD) is an important date for pregnant women and their health care providers as it sets benchmarks for the pregnancy as well as an estimate of when baby is due. The estimated due date is also known as the estimated date of confinement (EDC). So When is my Baby Due? Due dates can be calculated either by formula or from ultrasound measurements of the growing baby. Formulas are quick and easy and can be used by anyone. However, ultrasound in the first trimester is the most accurate method for establishing or confirming a due date. In the US, the American College of Gynecologists and Obstetricians has issued recommendations which define when it is appropriate to use an LMP formula to calculate an EDD and when an ultrasound based EDD should take precedence. Since the actual date of conception is not normally known, the LMP formula begins counting pregnancy from the first day of a women's last menstrual period (LMP). This can be a little confusing since counting starts about two weeks before true pregnancy begins. But it does provide a useful starting point for calculation of due dates and pregnancy progress. The terminology of pregnancy dating is based on the LMP formula. Counting pregnancy from LMP is the basis of gestational ageing which is the way pregnancy progress is measured and recorded. When counted from conception, pregnancy is 266 days, or 38 weeks, from conception to estimated due date. Actual length of pregnancy: The actual length of pregnancy varies considerably, even when conception is known. An estimated due date should be thought of as an indication of a range, or time frame, when baby might come. The modern formula, LMP + 280 days = EDD, is based on a older formula called Naegele's Rule. Naegele's Rule is named after the German professor of obstetrics who popularized the simple formula in the early 1800's. Naegele, in turn, credited a Dutch professor of botany and medicine (Herman Boerhaave) from the 1700's for its creation. When Naegele's Rule was first created, the medical community didn't know when conception occurred so it made sense to measure pregnancy from the start of menstruation, a date easily observable to women. For two hundred years, generations of women have been given EDDs based on this simple and relatively reliable rule. EDDs calculated using Naegele's Rule differ slightly from each other depending on the particular months being counted but always result in a length of pregnancy that is close to or exactly 280 days. A pregnancy wheel is a simple device used by obstetricians and midwives to calculate due dates and gestational age. A pregnancy wheel may be used throughout pregnancy to track progress and for making prenatal appointments. An arrow is rotated on the circular wheel and an EDD is indicated along with current gestational age and additional information such as test dates and baby's estimated weight. Pregnancy wheels may be purchased for home use. Pregnancy wheels have been used for decades but it is just as likely your obstetrician or midwife now uses a computer calculator such as Weeksduringpregnancy.com's How Far Along Am I calculator or Due Date calculator. Pregnancy wheels and computer calculators are both based on LMP + 280 days. Computer calculators add 280 days to the first day of a women's last menstrual period (LMP) to reach an estimated due date (EDD). This formula is often referred to as Naegele's Rule although the original Naegele's Rule is less precise. If conception is known, the calculator begins with the conception date and adds 266 days to reach an estimated due date. If your cycle is regularly shorter than 28 days, subtract the difference from the EDD. If your cycle is usually 24 days, subtract 4 days from your EDD. If your EDD was October 7, it is now October 3. Conversely, if your cycle is regularly longer than the presumed 28 days, add the difference to your EDD. If your cycle is 30 days, add 2 days to your EDD. If your EDD was October 7, it is now October 9. To calculate how long your menstrual cycle is, count every day from the first day of bleeding until the day before the next bleeding. Include the first day of bleeding. This is a standard 28 menstrual cycle. However, if Period 2 begins on January 30, this would be a 30 day cycle. These ways of adjusting for cycle length are not always completely accurate since they are based on an assumption that the second half of the menstrual cycle (from ovulation to menstruation) is consistently 14 days regardless of the length of the full cycle. Research shows that the second half of the cycle (the luteal phase) is in fact variable - even in women who have consistent 28 day cycles. If your cycles are not regular, using formulas based on LMP to calculate an estimated due date is not recommended. Your health care provider will provide an estimated due date. You can calculate your due date without using a due date calculator. Count 280 days, or 40 weeks, from the first day of your last menstrual period; the date you end up with is your estimated due date. Calculating EDD Example: If the first day of your last menstrual period was October 1, 2015, count forward 280 days or 40 weeks from October 1 to arrive at your due date of July 7, 2016. The due date will always be the same day of the week as the day your last menstrual period started. In the example above, the first day of the LMP and the EDD are both Thursdays. If you are unsure how to calculate your EDD, use the weeks method. In the example above, we started with October 1, 2015 which is a Thursday. Then we went to the next Thursday which is October 8, 2015 and counted 1 week. We kept counting the Thursdays until we had counted 40 weeks. Once you have calculated your EDD, check your results by going to our due date calculator where you will also find additional information about your due date. An increasing number of women know their ovulation date. If you know yours, add 266 days to your ovulation date to find your estimated due date. Conception generally occurs shortly after ovulation (about 12 hours afterwards) so it is reasonable to use the date of ovulation as an approximate date of fertilization. Fertility treatments fall into two main categories, those that involve handling of both egg and sperm and those which involve handling of sperm only. If your pregnancy is the result of fertility treatment, the way the estimated due date is calculated depends on the procedure used. ARTs include a wide range of procedures but to meet the Centers for Disease Control and Prevention (CDC) definition of ART, the procedure must involve handling of both egg and sperm. In vitro fertilization (IVF) is an example of an ART. In IVF, an egg is fertilized outside the woman's body and the resulting embryo is then implanted into the woman's body. Add 266 days to the implantation date and then deduct the age of the embryo at the time of the implantation. Artificial insemination involves the implantation of sperm into the cervix or uterus. It is not an ART according to the CDC definition since it does not involve the handling of ova (eggs). Artificial insemination is a relatively simple procedure which may be carried out for various reasons including use of donor sperm. The object is to introduce sperm into the woman's body when she is most fertile; conception then occurs shortly after ovulation. Add 266 days to the ovulation date. This due date may be adjusted following the first ultrasound scan. Gestational age: When pregnancy is counted from a women's last menstrual cycle, it is called gestational ageing and is 40 weeks, or 280 days, from the first day of a women's last period menstrual period to EDD. Throughout your pregnancy, your progress and prenatal appointments will most likely be in gestational weeks, meaning completed weeks since LMP. Even if your due date is based on ultrasound measurements, your pregnancy will probably still be recorded in gestational weeks (you may be given an adjusted start date). Example of gestational age: When you find out you are pregnant, you will probably be at least 4 Weeks' pregnant in pregnancy terminology. This is the gestational age of your pregnancy. If you are 4 Weeks' pregnant, you have completed 4 weeks since the start of your last period. Yet you have only completed two weeks (approximately) since baby was conceived. Two weeks have been artificially added to your pregnancy progress. Don't worry about the extra two weeks, it's just the way pregnancy is measured. You can keep track of your weeks by using our how far along am I calculator. Fetal age: When pregnancy is counted from conception, it is called fetal ageing and is 38 weeks, or 266 days, from conception to EDD. Unless known otherwise, fetal age is assumed to be two weeks less than gestational age. Despite the popularity of LMP formulas, they have a number of drawbacks. Not all women ovulate on day 14 of their cycles. A major problem with formula methods is the assumption that all women ovulate on day 14 of their cycles. This can result in the fetus appearing to be several days younger or older than it really is. Research shows that not all women ovulate on day 14, even those with regular 14 day cycles. If a woman's cycles are irregular, the use of an LMP formula is not recommended. Many women do not record their menstrual dates or may do so inaccurately. Also the date of the last period may be uncertain, for example, if bleeding was light; it may have been a period or it may have been bleeding occurring after conception. If a woman has used hormonal birth control within two months of the LMP, use of the LMP method may not be accurate. Don't worry if you don't know the date of your last menstrual period or if you're not sure. 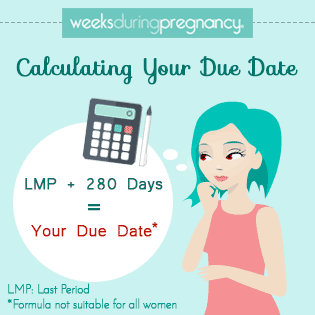 You won't be able to use an LMP formula to calculate your own estimated due date but your medical practitioner will provide you with an EDD after your first ultrasound scan. During an ultrasound scan, measurements are taken of the growing baby and matched against recorded averages to obtain an estimated gestational age and due date. Calculating due dates from ultrasound measurement removes many of the problems associated with formula methods and when performed in the first trimester is considered the most accurate way to estimate due dates. Following your ultrasound scan, your EDD may be revised if the ultrasound based EDD differs from the initial EDD by a designated amount for the gestational age of the fetus at the time of the scan. In the earlier stages of pregnancy, fetal growth is relatively uniform. If your early pregnancy scan shows your baby is smaller or larger than expected, the difference may be attributed to baby's age being different than expected and you may be given a new EDD. But as pregnancy advances, babies develop at different rates influenced by genetics, ethnicity, environment, and so on. Health care providers become increasingly reluctant to revise due dates based on fetal measurements since fetal size reflects a number of variables and not just fetal age. Due dates in later pregnancy are only revised when there is a significant difference between the LMP based EDD and the ultrasound based EDD, and even then, only upon careful consideration. The American College of Obstetricians and Gynecologists recommends adjustment of the initial EDD if the ultrasound based EDD differs by the following amounts. Once an estimated due date has been set based on ultrasound measurements, it will rarely be changed since fetal growth is a reflection of healthy development as well as age. Initial calculation of EDD: An initial due date is likely to be calculated at the initial prenatal appointment if a reliable LMP date is available. Following the first ultrasound scan, the EDD is then confirmed or revised as appropriate. Assisted reproduction techniques: LMP + 280 days is the appropriate method for calculating estimated due dates when pregnancy is the result of an ART (assisted reproduction technique). Medical professionals may use other methods to estimate pregnancy progress and due dates. These include measurement of fundal height (measurement of the mother's belly), time of first heart - beat, time when mom first feels baby's movements, and time of the first positive pregnancy test. These clinical methods are of minor value compared to ultrasound assessment. For most pregnant moms, the EDD itself is the main concern as they look ahead to baby's birth; a few days either way may be frustrating but nothing major. For medical professionals, though, a few days either way can be critical. For example, assessment of fetal growth depends on knowing the age of pregnancy. EDDs and age of pregnancy are also important in decision making if labor starts early or has not started at 41 or 42 Weeks' pregnant. Although it's good to have a date to look forward to, only a small percentage of babies (about 4%) actually come on the due date, with most coming within a week or two before or after the EDD. Rather than hoping or expecting to have your baby on the EDD, in the US, clearly defined weeks of pregnancy reflect the optimal weeks for giving birth. As long as mom and baby are both doing well, research has shown that most babies do best when born at 39 or 40 Weeks' gestation. Early Term: Baby has excellent survival chances if born now but further growth and development in the womb is best if baby and mother are both doing well. Full Term: Baby is ready to be born. This is the best time for delivery in most cases. Late Term: Your pregnancy will be monitored more closely now. You may be given the choice of waiting or being induced. Post Term: You will continue to be monitored. Induction is very likely. Only a small number of babies are born on the due date; most will be born either before or after the estimated date. However the Estimated Due Date is a useful guide which gives everyone involved a rough idea of when baby is likely to come. Our calculator strives for the greatest accuracy however miscalculations or discrepancies in dates may occur due to miscalculation, incorrect input dates, and/or individual differences in cycle timing or rate of development, for example. Results may not be reliable if you have taken oral contraceptives in the previous two months. The use of due date calculators is not recommended in this case. Multiples: Do not use the due date calculator if you are carrying twins, triplets (or more). Your health care provider will calculate an estimated due date for your babies. This calculator assumes pregnancy lasts 266 days from ovulation/fertilization. It also assumes your menstrual cycle is regular, is 28 days long, and that your luteal phase is 14 days long. Leap Years: Our due date calculator takes leap years into account when calculating EDDs in leap years.